This activity is great for real motorsport lovers as well as for those who have never tried such activity before. Discover the thrill of Riga off-road quad bike riding in this exhilarating experience. Get ready for speed, mud and unforgettable emotions! 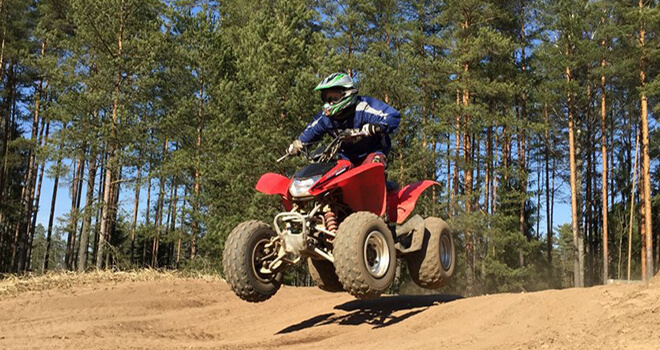 We will pick you up from your hotel to drive out of Riga to the quad bike track. Then your quad bike off-road adventure will start with choosing the right equipment – helmet, boots, dungarees, safety briefing and driving instructions. If you choose off road ride through forest roads, paths and small obstacles, then first 5-10 minutes you will drive on a circuit track to learn the techniques to control these great fun machines so later you can put your newly gained handling skills into practice. This tour will combine the thrill of riding a quad bike over challenging and varied terrain as well as giving you the opportunity to get out into the tranquil scenery of Latvia and explore unspoiled areas of natural beauty. If you go for a forest drive, we can offer 5 quad bikes. What happens if you are with a group of more than 5 people? You will be divided by groups of up to 5 people. While the first group is in a forest the rest of you can either be taken to a Bobsleigh and Luge track for either Olympic Bobsleigh; Skeleton Bobsleigh; Soft Bobsleigh rides (available from the end of October until the end of March) or Summer Bobsleigh rides (available from beginning of May until the end of September). This activity must be booked in advance. Another option is to make a BBQ near the track while wait for your turn. There is a table, benches and a mangal (barbeque) to grill chicken wings, chicken breasts, sausages, shashlik, steak, etc. You can buy all groceries by yourselves (please note that you also need charcoal and flammable liquid) or send us the list of food/drinks and we will buy them for. Please note that the beer or any other alcohol will be allowed only for those who has already done the quad bike activity. Another option you can choose is a 30 minutes racing around the rugged circuit track. Also in this case if you want, you can make a barbeque while watch how your friends drive on a track. • Please take your ID card (can be a passport, driver’s license, Student`s card or a National ID card) with you as you will have to read and sign conditions of use of quad bike.